Hi Crafting Chick fans! I’m Kara, and I’m happy to be participating in this “Deck the Halls” series. I blog at Creations by Kara where I share recipes, crafts, and thrifty DIY home decor ideas. I love Christmas music, and I’ve been listening to it since the beginning of November. (Don’t throw snowballs at me.) 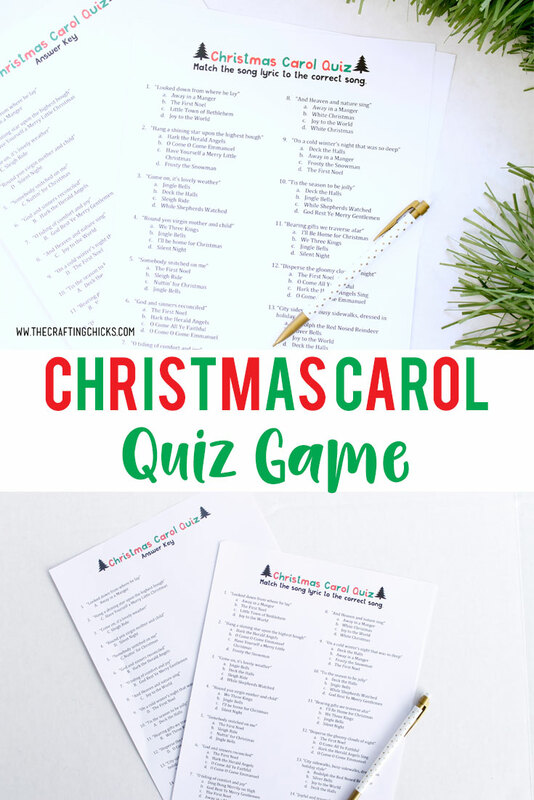 I have so many favorite Christmas Carols, and today I’m sharing a game that features several of them. I love playing games, so I’m often asked to bring game ideas to Christmas parties. So you can bet that any time I play a fun game, I take note of it in case I need to use it later. I have a binder stuffed full of ideas from parties over the years. 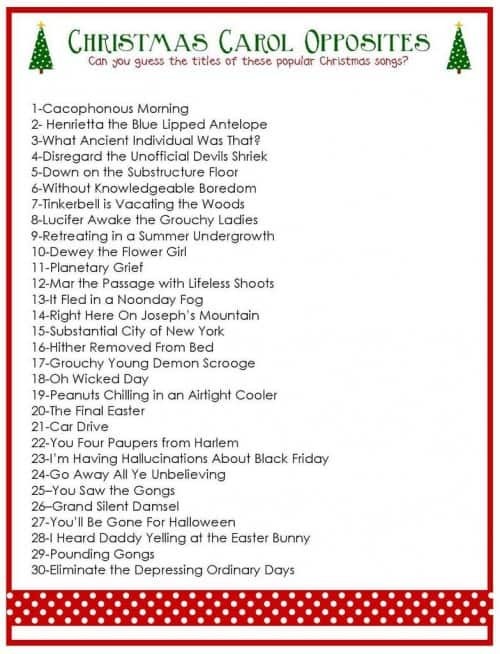 Many, many years ago I played a mixed up Christmas Carol game at a neighbor’s Christmas party. I kept a copy in my Christmas binder just in case I ever needed it. This year I decided to take out that old dog-eared paper and re-type it so we could play it again. I even had my family help me update it with a few new titles. Some of the songs are pretty easy to figure out, but some of them are a little more challenging. They are all pretty silly, so it’s good for a few laughs. Hope you have fun playing it at your next Christmas party! 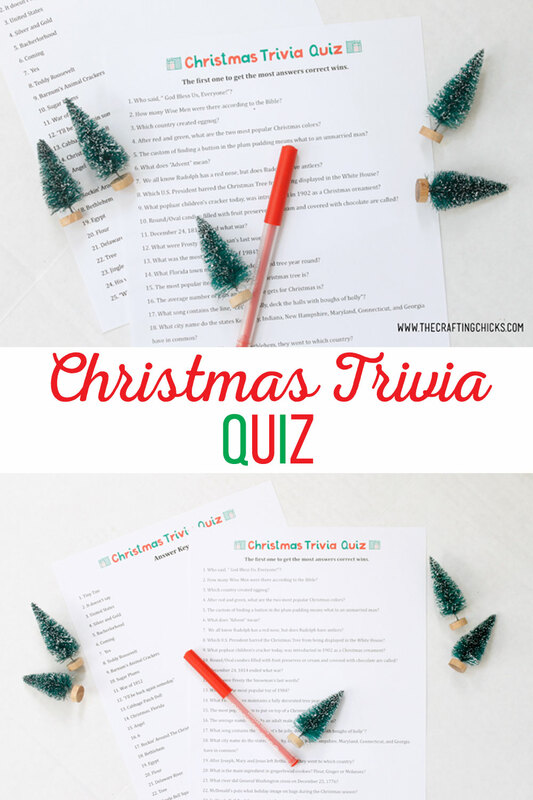 To download the Christmas game, just click the link below. The answers are printed on the second page. I hope you all have a very Merry Christmas and that you take time to relax and spend time with the people that matter the most to you! I’m with you. It says “click the link below” to print the game but I see no link anywhere. Just a lot of trash ads. That is why I do not spend much time on sites like this because to get at anything useful you have to waste so much time weeding through garbage. Hoping to find a similar game somewhere else on the net. Sorry about that Candace. I’ve updated the link so that you can see it more clearly. You’ll find the answer sheet included in the download on the second page. You’ll find the answer sheet included in the download on the second page. The answers are on the second page of the download. You get those with the questions.